This is our friend Tommaso Capozzoli. He is, among many other things, the sales manager for Stefano Bemer, and we usually stay with him when we’re in Florence. Tommaso has style. It is not loud, and it’s unlikely to stand out at Pitti, but it is subtle and personal, much as I wish mine to be. He used to run a menswear shop in Florence and this unlined jacket is one of theirs, with trousers from Giabs (good Italian producer, mostly wholesale but some reatail). 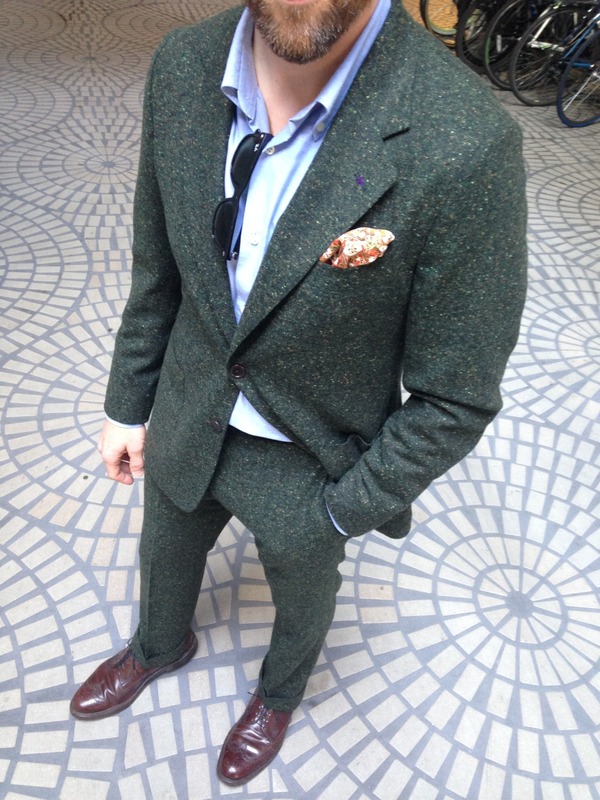 He uses a local tailor in Florence for suits, made with narrow, high-waisted trousers and 2-inch turn-ups. This image was taken the night we arrived, as he waited outside Sostanza, slowly smoking his Tuscan cigar. Next morning, it was navy long-sleeved polo and old, pale jeans. In both cases, with well-worn Bemer shoes. Tommaso says he doesn’t want to be a style icon. But he always says it with this smile on this face. I don’t believe him. You can follow the discussion on Tommaso by entering your email address in the box below. You will then receive an email every time a new comment is added. These will also contain a link to a page where you can stop the alerts, and remove all of your related data from the site. Worth taking a look at Epaulet, particularly the duck canvas chinos. Frasi – Simone Righi’s brand. Very beautiful, outsourced to a smaller white label trouser maker as I understand it. 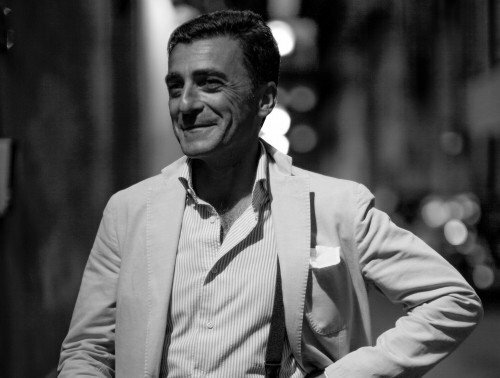 The guy above does have a great style, pretty standard for well dressed guys in Northern Italy in my experience. The riddle is why you Brits need Italian trousers. What happened to the British trouser? If you insist the Italian mill is superior, the same question arises? I meant if one answers the question why aren’t satisfactory trousers manufactured in UK by replying because the mills which weave the best quality trouser cloth are in Italy, this answer is not satisfactory, as you point out, Simon. You say the Italian cloth could be imported to UK and trousers made. But you, a Brit with great interest in clothes, are dissatisfied, or better, prefer trousers made in Italy! That’s amazing that no British trouser manufacturer is good enough for you! What happened to UK trouser manufacturing? Ovadia and Sons, Full Count & Warehouse all do great chinos. Everything very neatly done. One question: do the braces have clips or buttons? And do you have an opinion on the matter when it comes to casual trousers like these? Simon, do you think a jacket like this is a worthwhile commission for a tailor? I like the make and material of Boglioli jackets but think they’re too tight and short. Don’t you think his jacket sleeve is too long? Do you have any idea when (and if) there is going to be a new round of the dartmoor? Fall is closing in! And if you have the time: Do you think the forrest green Dorset by JS (http://www.johnsmedley.com/uk/ss14-dorset-in-forest-green) would go with a blazer in this green donegal fabric by Ariston: http://38.media.tumblr.com/e1aae2fcdceb5699f785e578b5903174/tumblr_n6odnxboiq1s24dz1o1_1280.jpg ? A navy would probably be better, but I really like the forrest green. Hi Simon. Thanks for this amazing blog. I am looking to buy my first pair of black tie shoe and I am hoping you can give me some advice! This would be for not-too-formal events like charity / member club balls and weddings. I work in a casual dress office so I don’t need versatility here. 1) patent vs calf leather. Is patent too formal / loud (because of the shine)? Is patent higher maintenance? I hear more and more people are wearing calf to black tie events..
2) plain vs cap vs wholecut? Again, caps becoming more common / acceptable? or just makes you look silly? What do you wear? I’d avoid patent – less versatile, and it’s just a plastic layer, essentially. Go for calf whole-cuts, or plain-toed, if you can. And polish them to a high shine! Surely it’s Tomasso? (one m, two s)? As everyone knows, it is a general rule of thumb to button your jacket when standing. 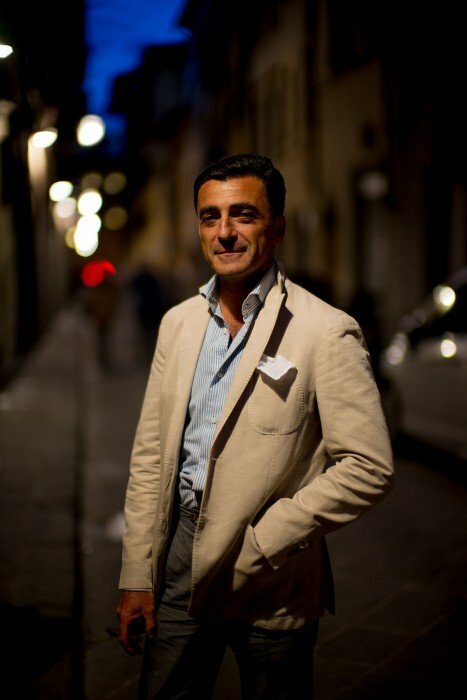 This is a rule I adhere to, but recently I’ve been leaving my jackets unbuttoned (taking inspiration from people such as Tommaso Capozzoli), as I feel like it comes across as more casual. While I agree that jackets look good when buttoned, I do believe that leaving a jacket unbuttoned whilst standing can also look flattering. As a result, I wanted to know your opinion on this topic and why famed style icons who may understand this rule still choose to break it?